If you'd like to see these and lots of other completely irresistible things our baby can do, please come on over. We're enthusiastically accepting guests!! Don't you love to look back at these pics?? I'm so happy I've done it too! I also LOVE the overalls! Too cute. - Being able to sit in a chair! 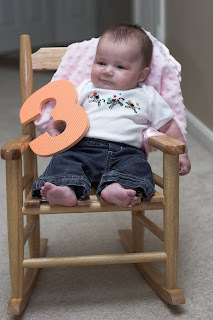 Great pictures and great idea with taking her pictures with the numbers each month! 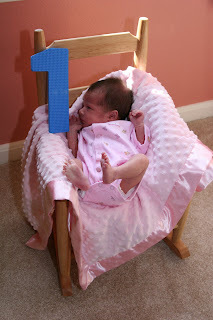 Wasn't it awful how I made her lie down in that chair when she was one month old?!? 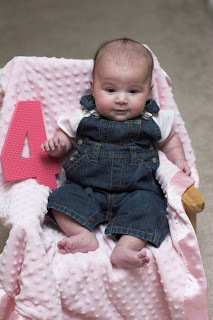 We just wore the overalls for the first time, and I want to get ten more pair! I love them too! 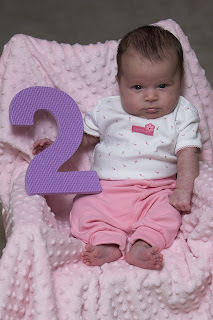 i can't believe how much she has grown, even since seeing her a few weeks ago. cliche but...she gets more beautiful each day.